After 55 hours without anything newsworthy to post, I've decided to turn to pseudo-news. If you've been following Icethetics for any length of time, you know the one thing I don't like is rumors based on video games. Sadly, I have nothing else to tell you about at the moment. Eric and Alex both wrote in this week to tell me about some things they noticed while watching preview videos for the forthcoming NHL 10 video game by EA Sports. I understand the game designers really try to get things correct when it comes to uniforms, but I'm always cautious against taking it as gospel. Still, I write tonight on the subject just in case there's any truth to it. Let's start with the Calgary Flames. Eric tells me something's up with their socks. Yes, their socks. When the Rbk EDGE Uniform System was first introduced two years ago, the Flames (and Lightning too) were afflicted with a rather untraditional sock design. From the front, stripes appeared to run horizontally around the leg, but when you got a look at the back, there was a little surprise. The collective reaction to this was a confused WTF? In the last two years, many fans have bemoaned this issue, apparently, onto deaf ears. Or are they? (Deaf, that is.) A screenshot from NHL 10, offered up via EA's official web site, depicts something different. These stripes wrap all the way around the leg. It begs the question: As a person who's never played the game, did NHL 09 feature accurate stripes, or did they wrap fully as these do? Perhaps someone in the know can assist with the answer so we can better speculate on the state of the real-life uniforms. While we wait for that, Alex tells me NHL 10 suggests the Flyers may be making a minor change to their orange jerseys. This is by no means reason to stop any presses. First, we do know that it will be promoted from third jersey to home jersey this season (as the black sweater switches to an alternate role). A noteworthy feature of the sweater is its white nameplate, as seen below. The nameplate isn't the only thing that sets this jersey apart from the rest of the NHL. (It's also orange. Not blue or red or black or white. Orange.) But another video from EA Sports is making us question whether this nameplate madness is going by the wayside. If they are losing the white nameplate, I hope they learn that white is easier to read on orange than black. Especially on TV (hint). Though it wouldn't surprise me in the least if they ignore this fact. So there it is. Take it for what's it worth. If it ends up being inaccurate, you didn't hear it from me. If it ends up being true, you heard it first on Icethetics. While we ride out this newslessness spell, do your civic duty and cast some votes for the IceHL. I've got a couple of updates to this post this morning. As Steve points out in the comments, it looks like the Flames' socks are likely getting a makeover. 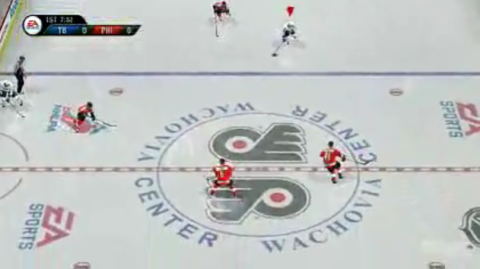 Not only does NHL 10 have the horizontal stripes (after having used the old version in previous games), but NHL 2K10 also appears have them too. So that's one theory I think we can run with. Flames fans, what do you think? Are the folks in charge finally listening? As far as the Flyers, that part of this post was almost unnecessary. It appears the white nameplates will remain on the orange jerseys in NHL 10, but in a screenshot from a newer video, they will evidently span from shoulder to shoulder, as opposed to simply being the length of the player's name. I know it's hard to see, but right in the middle there is No. 6, Randy Jones. If you click on the image, it takes you to the YouTube video where I grabbed this screenshot. Then you can watch more of the Flyers/Lightning gameplay. Anyway, if you're still questioning my aversion to using video games as uniform news sources, take the Flyers as a prime example. Last year, in NHL 09, the weight of the typeface on the nameplate was inaccurately heavy. Sounds like this year they've fixed that, but now the nameplate itself is inaccurately wide. The Flyers kick off their preseason in Detroit on September 16, then play as the "home team" in London, Ontario a night later. I expect one of those nights we'll see the orange jerseys for the first time this season and I wouldn't expect them to be any different than they were last year.